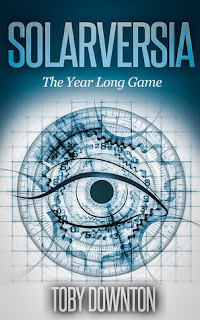 If you like reading near future science fiction books, you'll love this one. It's full of cool ideas about artificial intelligence, the future of video game technology, and a whole lot more. If you enjoyed one of my favorite books, Ready Player One by Ernest Cline, there's a great chance you'll have a blast reading this book too. The main character and her friends join Solarversia, a yearlong game that promises fame and riches to the person who wins at the end. I loved the places described in this virtual gaming world and how the characters interacted with it. A lot of time their real world problems got in the way of their in game quests - things like homework and studying. I loved the vehicles the characters got to use in the game world and the exotic locations they got to visit. Some of the locations had cool things like places where the gravity was altered so you could walk upside down. Stuff like that made this a fun read to experience the stuff happening with the characters. I'm not going to spoil anything in this review but I have to mention another part of the stort that was very interesting. One of the characters dies but lives on as a virtual avatar who can be virtually visited be the living. So they live on in a way with ones and zeroes and act as they would in real life. The introduction of this into the grieving process of the real life lost was very interesting. It made me think about how weird and un-natural it would be. This is just one example that made you think about how weird it would be to live in this future world with technology we can only imagine right now. Another example is that one of the characters buys a breakfast cereal put out by the game company and if they're wearing their special glasses they can see little creatures come off the cereal box and interact with real objects on her table as she eats. Man my kids are distracted enough as it is while they eat, but it was fun to imagine what this experience would be like. Lots of things like this made this book fun for a nerd like me to read. Besides all the crazy quests and adventures the characters have in the game world, there are some pretty sinister bad guys in the real world called The Holy Order who are trying to bring about the destruction of the game and create... okay sorry I don't want to put spoilers in here so you'll have to read the book to find out what they're up to. But part of that is forcing cybernetic limbs on people who already had perfectly good working ones. Yep... slice. The one thing in this book I didn't care for was the sometimes gruesome description of people dying or getting... altered. I don't have the stomach for much of that stuff and the book seems like a Young Adult novel because of the ages of the characters and then this gory stuff... it grossed me out but even though I love Stephen King novels I’m kind of a weenie  Other than that this was a really fun story and I'm glad I read it. Have you read this book? What did you think? I'd love to hear your thoughts in the comments. Thanks for stopping by!